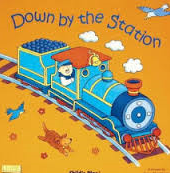 Down by the Station is a picture book is based on a traditional children’s song. It is designed as a single illustration of a village and farm landscape. A range of vehicles are revealed through cut outs as the pages are turned gradually filling the scene. There is a lot to talk about in the illustration and the words of the song and sound effects are fun to join in with. What can you see through the cut outs? Talk about all the things that are happening in the book, what are people doing? Talk about all the different kinds of transport you can see. Click here for the words. Use a big space and with toy vehicles and figures and building bricks or blocks to set up a busy transport scene like the story with your child. Look out for different types of transport. The Docklands Light Railway from Beckton to Limehouse in London – a front seat view.